Protesters have blocked the Pan-American Highway connecting Colombia to Ecuador. Duque has refused to travel to the department of Cauca to meet with indigenous organizations unless the blockade is first lifted. Indigenous protesters face a crackdown by the government and violent attacks from illegal right-wing paramilitary groups. The mass collective action now includes 20,000 people from Afro-Colombian communities, student groups, and campesino associations critical of the government’s environmental and social policies. Dialogue between the government and the indigenous organizations was temporarily suspended following a police crackdown aimed at breaking the blockades, during which an indigenous protester was reportedly killed. One person has reportedly died and another was injured after police in Colombia cracked down on a protest by indigenous groups demanding a meeting with the country’s president over land rights. 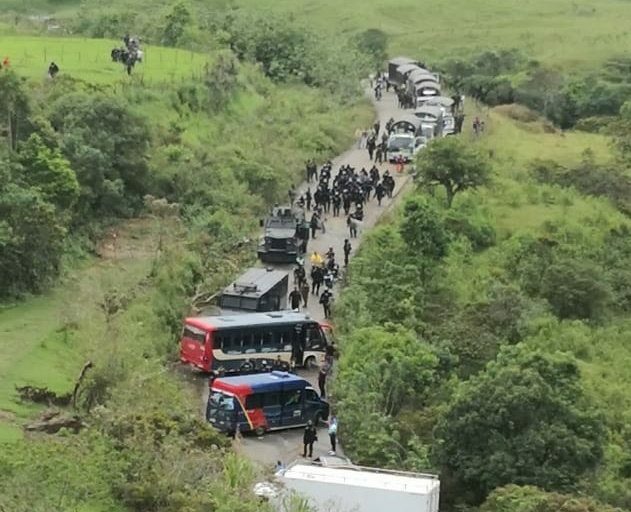 The incident occurred April 2 in the municipality of Cajibío, in Cauca department, an hour before the protesters were due to meet with Interior Minister Nancy Patricia Gutiérrez, El Espectador reported. The newspaper said two indigenous people were wounded; one of them, identified as Deiner Seferino Yunda Camayo, died of his injuries. Indigenous groups in southwestern Colombia have since March 10 mobilized mass protests, known as minga, to demand a meeting with President Iván Duque over his government’s failure to implement agreements made during the previous administration’s historic 2016 peace deal and recognize community land rights. Protest leaders estimate there were 20,000 people involved in the massive mobilization as of March 27, including Afro-Colombian and indigenous communities, students, and associations of peasant farmers, or campesinos. The Indigenous Regional Council of Cauca (CRIC) has denounced the crackdown by the police’s anti-riot squad, known as ESMAD. The caravan in Sampues, Colombia this week. Image via @ONIC_Colombia on Twitter. “This is an attack against the entire dialogue process that has existed up to today within the minga. It is an attack against the security and the life of every person at the camp and surrounding area,” CRIC said. Nelson Lemus, a CRIC council member, told Mongabay that the protesters wanted Duque to meet with the indigenous organization in Colombia’s Cauca department — something he has failed to do since taking office in 2018, CRIC said in a press release. 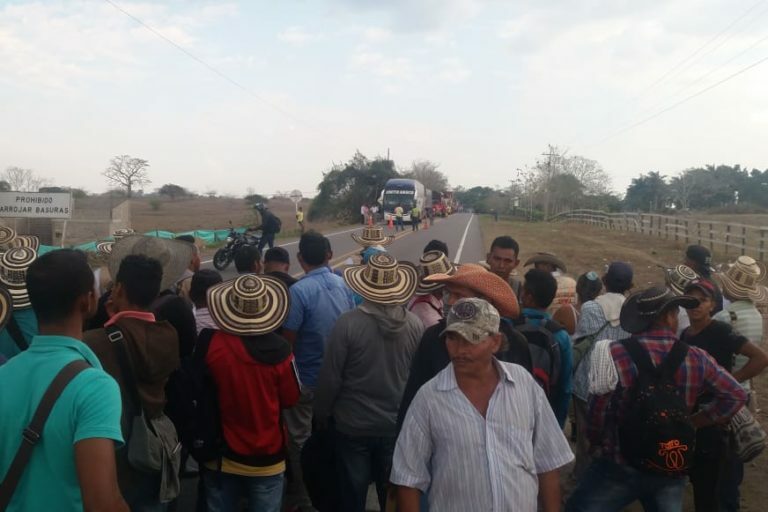 The protesters have blocked the Pan-American Highway connecting Colombia to Ecuador, and Duque has refused to travel to Cauca to meet with indigenous organizations unless the roadblock is lifted. “We should be able to come to an understanding through a legal framework,” Duque said in a public address to the country on March 28. CRIC criticized the president’s declaration, saying his portrayal of the minga as illegal undermines their right to protest and raises fears of violence at the hands of government and right-wing paramilitary groups. 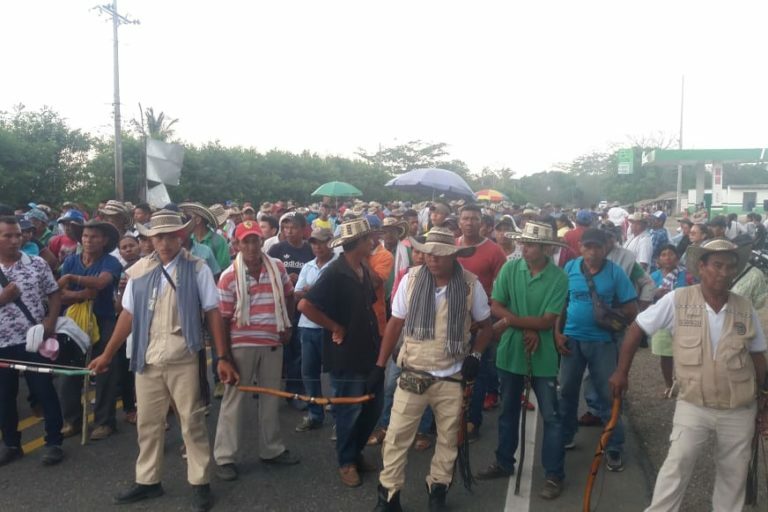 Colombia’s ombudsman, Carlos Alfonso Negrete, called on the president to sit with the indigenous protesters to end the roadblocks, which are seen as having a negative impact on the economy. The transportation of basic food supplies and gasoline has been impacted in southern parts of the country, and the Colombian Red Cross has activated a humanitarian caravan to provide medical supplies and assistance to affected communities in Cauca. The demands of the ethnic minorities participating in the minga include the incorporation of ethnic communities in the government’s recently announced National Development Plan; the protection of community leaders from targeted assassinations; and the guarantee of prior consultation for extractive or agro-industrial projects with impacts on indigenous territory. It also includes a demand for the full repatriation of 400 square kilometers (154 square miles) of land that was promised to indigenous people in Cauca by the former president, Juan Manuel Santos; only 14 square kilometers (5.4 square miles) has been delivered to date. CRIC says the land would have to be divided between 126 reservations in the department. CRIC has also declared its opposition to oil exploration in the form of hydraulic fracturing activity, or fracking, that has begun at three pilot locations in the Magdalena River valley. Five companies, including ExxonMobil, ConocoPhillips and state-owned Ecopetrol, are seeking to operate six proposed fracking blocs. Indigneous protesters in the Cauca department of southwestern Colombia are directly in the path of armed military. Image via @ONIC_Colombia on Twitter. When the protests first broke out, Duque said his administration would not negotiate with the indigenous organizations until the Pan-American Highway blockade was lifted. Instead, he sent in ESMAD to forcibly break up the blockade. As the government cracked down on the protesters, however, roadblocks sprang up in indigenous communities in the nearby departments of Chocó, Huila and Putumayo. This increased pressure forced Duque to reverse course by sending Interior Minister Gutiérrez to Cauca to negotiate with the protesters. The protesters lifted many of their blockades while still maintaining the main block on the Pan-American Highway. But in a televised speech, Duque accused the indigenous groups of having been infiltrated by dissident armed rebels, after a policeman from ESMAD was shot dead, apparently by a sniper, near a protest in Cauca. On March 22, an explosion in remote indigenous territory in Valle del Cauca department killed nine indigenous protesters. Before launching an investigation, the government claimed the deaths were caused by an accident. The National Indigenous Organization of Colombia (ONIC) rejected the notion that indigenous people were responsible for the explosion, calling the incident a paramilitary-led massacre. “The indigenous people are people of peace, not terrorists,” ONIC said in a public statement. In 2016, then-President Santos signed a historic peace agreement with the country’s largest armed rebel group, the FARC, hoping to close the chapter on a cycle of political violence that had lasted more than half a century and left 220,000 people dead and displaced millions more. In addition to demobilizing the largest rebel army in the Western hemisphere, the peace deal aimed to dismantle a paramilitary phenomena that first arose in the 1950s, when wealthy rural elites, with assistance from U.S. military counterinsurgency advisers, formed private militias to protect their property during a decade of war between the Liberal and Conservative parties. By the 1990s, the paramilitary groups had taken on a prominent role in Colombia’s armed conflict. These groups, responsible for massive human right abuses, were often referred to as the “Sixth Division” of the Colombian armed forces because of their thorough integration into the army’s battle strategy and actions against left-wing guerrilla armies. When the FARC demobilized in 2017, narco-trafficking paramilitary groups and a smaller rebel outfit, the ELN, took advantage of the power vacuum to flood into the territory abandoned by the guerrillas. Since then, Colombia has experienced a troubling rise in targeted killings against community leaders. Indepaz, a nonprofit conflict monitor, says 566 community leaders have been killed since the end of 2016, with the highest number in Cauca. Santos’s predecessor, Álvaro Uribe, who handpicked Duque as his political protégé, publicly promoted the formation of paramilitary-related “citizen watch groups” under a program known as CONVIVIR when he was the governor of Antioquia department. Uribe is now under investigation by the Supreme Court for his role in paramilitary massacres and assassinations during his time as governor. The rate of murders of community leaders has increased since Duque assumed office in 2018. Before the protests in southwest Colombia started, pamphlets signed by the far-right paramilitary group Aguilas Negras were circulated through local communities, offering rewards for the assassination of indigenous leaders. Since the signing of the 2016 peace agreement, ONIC has recorded 117 murders of indigenous leaders, 61 of them since Duque took power. Banner image: Locals in Colombia say they have seen deforestation accelerate rapidly over the course of the past decade. Image by Taran Volckhausen for Mongabay. About the reporter: Taran Volckhausen is Colorado-based freelance journalist who regularly reports from Colombia. You can find him on Twitter at @tvolckhausen.